There are only two days left to submit your abstract for the 2017 SBI/ACR Breast Imaging Symposium. The deadline is on November 14, 2016. Click here for the abstract guidelines. 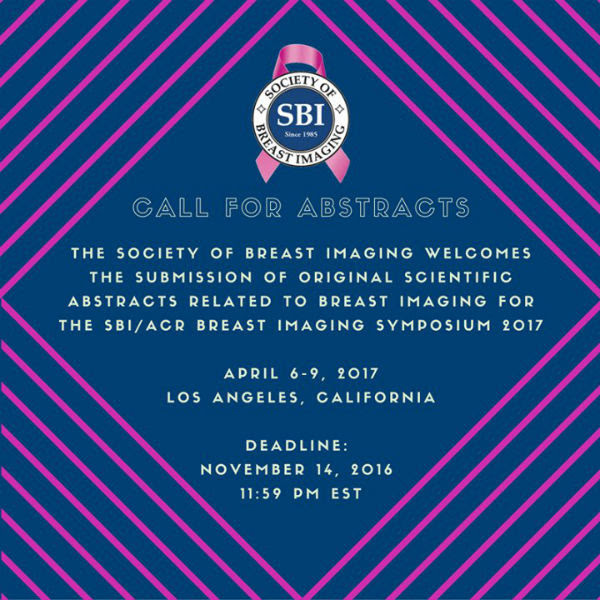 One presenting author for each accepted abstract will be given free registration for the 2017 SBI/ACR Breast Imaging Symposium in Los Angeles, CA on April 6-9. Two research prizes will be awarded: one to a medical student/resident (at time of submission) and one to a fellow in training (at time of submission), based on scientific merit. Research prizes include $1,000 and a plaque to each winning resident and fellow. Winning abstracts may be reproduced in the SBI Member Newsletter. Don´t miss out on this opportunity! Submit your abstract today!